I've been prepping for a work trip. Which means attempting to find a good resting place for projects before stepping away from them for a short time. This past week has been a bit of a build-up to my department's January meetup at HQ up in Philadelphia. Most of us are distributed around the globe but we do meet up in person three times a year for a week in January, May, and September. Lowlife is on Hulu (which I've been trying out). I'd heard about this film from when it was on on the festival circuit and decided to check it out. Has a kind of Pulp Fiction vibe to it, with several different stories which join in a violent collision. It was fun. Glass is the third film in M. Night Shyamalan's series which started out with Unbreakable in 2000. Split, the second film was a surprise sequel. Glass brings all the main players in those films together for a pretty good conclusion. I loved all three films, but if you haven't been a fan this far, I'm not sure why you'd be seeing this one. I really enjoyed this one. I mentioned Hulu. I've been a happy Netflix subscriber for a long time. I've kept my eye on Hulu but they haven't had any content that's really enticed me to subscribe. Their recent series for Marvel's Runaways and Castle Rock were enough to get me to take advantage of a recent offer they to subscribe for a year for $12. I haven't seen Castle Rock yet, but I'm in the second season of Runaways and while it's okay, I'm not seeing myself right now continuing with the subscription beyond my cheap year's commitment. After watching the films Bone Tomahawk and Brawl in Cell Block 99, I became a fan of S. Craig Zahler and sought out most of his output in film and print. When I came across The Narrow Caves on Audible, it was an instant add to my cart. It's unique in that it's read by a full cast and it took a little bit before I realized they are basically reading a movie script. Really great cast acting it out. The story was very entertaining to listen to. Zahler's stories thus far follow a kind of similar pattern where it's a slow crawl as you get into the characters culminating in some scene of extreme violence and horror. Here's my current reading list if you're interested. 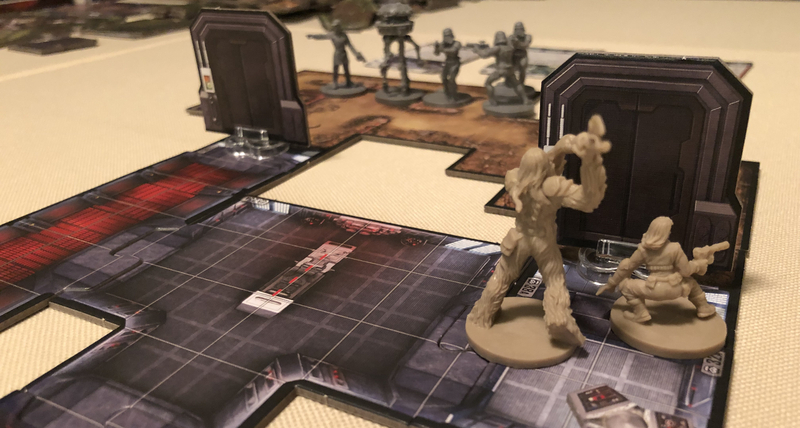 The Star Wars based board game Imperial Assault was on my table. I played through the tutorial from the game itself, then used its app to have it guide me through an initial scenario. I'll likely play it solo most of the time, so I'd likely use the app most of the time. The app was great in this and would help even with multiple players. With it, the map you play on and characters who come in are a surprise as new things come up during the scenario. In a normal game without the app, the map is generally fully visible from the start. I enjoyed the game enough that I know I'll play it again. There's a lot of expansions but hopefully I can postpone adding those until after I complete all the scenarios available in the base game.